The Guelaguetza is one of Mexico’s most important festivals. The ‘big days’ are two Mondays in late July when the regional dances are performed in the ginormous auditorio, but the atmosphere that pervades Oaxaca is a celebration that transcends the marathon performance. 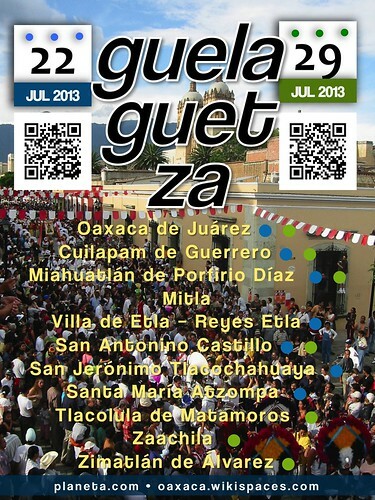 Today is the octava and the conclusion of the best Guelaguetza season in years. Can’t make it this year? Mark your calendars – July 22 and 29, 2013. Mazatlan 2011 Carnaval Parade Video – You’ll Want To Save Your Space For 2012! Over 300,000 locals, tourists and expats were part of the crowd along the Malecón to enjoy the Carnaval’s parade – you’re going to want to join in the fun next year! YouTube fans will be pleased to know that Mexico’s National Institute of Archaeology and History (INAH) has established a channel on the world’s favorite video-sharing website. Called INAHTV, the channel currently offers 108 videos highlighting some of Mexico’s most important archaeological zones, museums, historical sites, traditional arts and festivals, as well as other cultural treasures. The commentaries are all in Spanish; but even if you don’t understand the language, these expertly produced videos are worth checking out for their visual impact and variety. Mexico’s most famous tree, the ginormous Tule Tree (Arbol del Tule) grows near Oaxaca City. Rooted in the town of Santa María del Tule, the tree is the centerpiece of unique, living natural monument. Yesterday’s party was a colorful affair that was the liveliest in several years. Leonidas Plaza, on Thursday, September 18, 6pm. bits and bobs of tourism materials. crafts and sale of the famous postcards from Oaxaca. GLENDALE, Calif.,/PRNewswire/ — This Halloween, alongside chocolates and candy, Willy Wonka is bringing out pan de muerto and sugar skulls in anticipation of this year’s Dia de los Muertos (Day of the Dead) WONKA Arte contest. Beginning August 22nd, teens are invited to show Willy their talent by creating art that reflects what Day of the Dead means to them. As part of the WONKA Arte program, WONKA is partnering with Latino cable network, mun2, who will host the Day of the Dead contest via www.HolaMun2.com/wonka. mun2 staff and celebrities will judge all art entries and select fifteen finalists, which will get their art pieces posted on the website. Visitors to the site will be able to view all entries and vote for one grand prize winner. All entries will be judged and narrowed down to the top 15 finalists by mun2 VJ, Pico, mun2 staff and celebrities. All entries will then be posted in a special gallery on HolaMun2.com/Wonka. Visitors to the site will view entries and vote for the final grand prize winner. The grand prize package is valued at over $2,200 and includes: a Macbook Pro computer, an iPod nano and a $150 iTunes gift card. Those who vote will also have a chance to win an Apple iPhone as part of a separate online voter’s sweepstakes, which is open to legal residents, 13 years of age and older. No purchase necessary for sweepstakes or contest. Voting period ends October 22, 2008. Winners will be announced November 2, 2008. Void where prohibited or restricted by law. See Official Rules at www.holamun2.com/wonka/rules for full details. Day of the Dead is a Pre-Columbian holiday traditionally observed in Mexico November 1 and 2. The holiday focuses on honoring loved ones who have passed away by celebrating their lives. Traditional ornaments, alongside items like sugar skulls, candies, photographs, papel picado, candles, incense and marigold flowers are included in altars made to honor a loved one. mun2 is the preeminent voice for Latino youth in America. Launched in 2001 as the first national cable network to offer bilingual programming for young U.S. Latinos, the multiplatform entertainment network offers authentic content that reflects the lifestyle of this fast-growing segment of the population with original, relevant and cutting-edge programs in proven genres including music, movies, sports, fashion, and social activism. The network, which reflects emerging trends in all areas of pop and youth culture that are endorsed by its bicultural audience, is available nationwide on digital and analog cable, and satellite and free television. mun2 is distributed to over 25.1 million U.S. TV households and is the first-ever Latino youth-oriented cable network to have full subscription to the Nielsen Hispanic Household Index measurement service. The network is part of Telemundo Cable Networks, a division of NBC Universal Cable Networks. The Willy Wonka Candy Factory company opened its doors in 1983. Since that time, Wonka has been dedicated to the art of producing fun, innovative, high-quality candies for kids of all ages. WONKA(R) candies include well-known favorites such as: NERDS(R), NERDS(R) Rope, Giant Chewy NERDS(R), SWEETARTS(R), SWEETARTS(R) SQUEEZ, SHOCKERS, LAFFY TAFFY(R), RUNTS(R), EVERLASTING GOBSTOPPER(R), LIK-M-AID(R) FUN DIP, PIXY STIX(R), BOTTLE CAPS(R), and the WONKA(R) Bar. Named one of “America’s Most Admired Food Companies” in Fortune magazine for the eleventh consecutive year, Nestle USA provides quality brands and products that bring flavor to life every day. From nutritious meals with Lean Cuisine(R) to baking traditions with Nestle(R) Toll House(R), Nestle USA makes delicious, convenient, and nutritious food and beverage products that enrich the very experience of life itself. That’s what “Nestle. Good Food, Good Life” is all about. Nestle USA, with 2007 sales of $8.25 billion, is part of Nestle S.A. in Vevey, Switzerland — the world’s largest food company — with sales of $90 billion. For product news and information, visit http://www.nestleusa.com/ or NestleNewsroom.com. This week Teotitlán del Valle, Oaxaca celebrates its annual festival. Included are desfile de mujeres (see video below), the feather dance, tamale fair and other activities.